In "Live the Dream!" Lowe creates a humorous critique of consumerism, consumption and the ubiquity and insidiousness of advertising in contemporary society. Visitors to the gallery must navigate Lowe's cash-and-carry installation, "Discount Barn," a mini-store of papier-mâché and ceramic iterations of the jumble of items normally found in 99 cent stores. The installation's abundant signage bears inspirational exhortations such as "Stop Wishing, Start Living! (Ask about our Senior Discounts,)" "Look 20 Years Younger (Must be at Least 21 Years of Age,) or simply, "Aspire." The shelves are loaded cheek-by-jowl with Lowe's humorous versions of items such as "Tear Stain Remover," "Anti-Wrinkle Gel Patches," canned goods and bleach, as well as editions of faux books with titles such as "How to Spot Value." Paired with the installation is a group of new enamel on panel paintings depicting the same sort of "Discount Barn" merchandise displayed in repurposed Baroque libraries and great rooms. With soaring, painted domed ceilings, elaborate chandeliers and other architectural flourishes, these former seats of social and political power, luxury, and higher learning have been transformed into palaces of commonplace consumption. 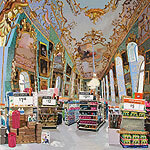 The interiors are based on composite photographs of extant monastery libraries, cathedrals, and chateaux made during Lowe's travels throughout Europe, but the artist has filled them with big-box store merchandise displays. Also in the exhibition are papier-mâché sculptures of items similar to those depicted in the paintings: a table piled with remaindered books, and stacks of sugar boxes and bottles of corn syrup. Throughout the exhibition, Lowe engages in a multi-pronged conversation about consumerism. 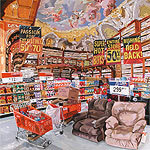 Although critiquing the power of advertising and its insistence that a purchased object can be reliably transformational, the artist herself is engaged in creating consumerist desire with the relatively inexpensive objects found in the "Discount Barn”, all the while acknowledging and asserting the role of the artist as a maker of things.